Error on the side of replacing when you have suspicions about an Adel Clamp (MS21919) on your business aircraft. 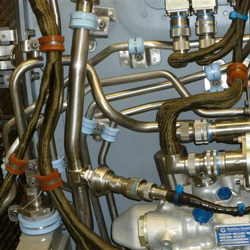 The wires that run throughout the aircraft and engine compartment need to be secured into bundles to prevent interfering with moving parts or chafing. During visual inspections, work cards will state to verify routing of electrical wiring, wiring harnesses, fuel lines, hydraulic lines and oxygen lines. Adel Clamps, AKA MS21919 aircraft clamps, are key components used in line support, vibration dampening and maintaining proper clearance for lines or harnesses running throughout the aircraft structure. The Adel Clamp is a metal band constructed from aluminum, corrosion-resistant steel and low-carbon steel, covered by a white rubber lining or cushion made from silicone. Older Adel Clamps made from low-carbon steel had different colored cushions depending on what materials they were constructed from: silicone (red), ethylene propylene (purple), chloroprene cushion (black). A visual inspection, no matter how trivial, needs to include the inspection of these clamps; and when necessary they need to be replaced. These cushions are exposed to heat, vibration, ozone and a variety of petroleum-based and synthetic-based fluids. Over the years, inspections have found cushions torn or missing, exposing the metal bands. In cases where the cushion is made from Teflon polyamide glass, dust gathered around the hardware or in the immediate vicinity indicates wear. These should be replaced. We have found conditions were the cushion’s wrapping edge is in good condition, however, a more detailed examination reveals the cushion has worn away on the inside of the band, creating a bare-band-to-line or -wire condition. When Adel clamps fail in these conditions, it has been noted on fuel systems to cause non-designed fuel migration, or a low fuel pressure situation. In hydraulic lines, Adel Clamp bands have been found rubbing through hydraulic system lines resulting in a loss of hydraulic quantity. Intermittent electrical faults have lead technicians to find an Adel clamp cutting into an electrical harness. The MS21919 aircraft clamp is used safely by many aircraft OEMs with very little trouble. However, a skilled technician will be looking closely at these clamps and know that their replacement is not trivial nor being too picky. The repair costs of the many systems they support vastly outweighs the cost of this simple preventive maintenance approach. Duncan Aviation has teams of experienced airframe mechanics provide service for almost every airframe maintenance event, scheduled or unscheduled. Emergency AOG service is available through our mobile Rapid Response teams. Technical support is available 24 / 7. We are authorized by several aircraft OEMs and foreign agencies around the world. Scott Shefke is an Airframe Tech Rep located at Duncan Aviation’s Lincoln, Nebr., facility, specializing in the Challenger airframe. He sits on the OEM Advisory Committee reviewing fleet and maintenance issues reported by operators working to improve the Challenger aircraft. His aviation career began in 1991.